Every Olympic cycle, the unveiling of the Norwegian National Alpine Ski Team uniform represents a major public event in the Nordic country. The manufacturer, Dale of Norway, offers the sweater on its website and members of the public create knitting patterns that mimic the pattern. This year, the 2018 Olympic team’s uniform is unraveling in a controversy surrounding a pagan runic symbol that is as knitted into the fabric of the nation’s history, as it is woven into the growing neo-Nazi movement that has swept through the globe in the past two years. The sweater features the Tyr symbol, which manufacturer Dale of Norway, the manufacturer of the sweaters, explains that designers used “the runic symbols for victory and protection.” The manufacturer argues that the rune is an important part of Nordic religion and culture. Moreover, it cited a noticeable renaissance of Nordic mythology in global culture as one of the main reasons it has chosen the Viking symbol, and their assessment may be spot on. The sweater also featured, Elhaz, the Life rune alongside the Tyr symbol, in a geometric pattern at across the chest. Dale may be on to something there, since the same runes have appeared in several pop culture products over the past few years. Here they are, etched into the trees in the Netflix horror movie “The Ritual,” which portrays a terrifying story of a lost troupe of friends hiking through a forest in Sweden only to find themselves entangled in a Pagan ritual sacrifice to a Norse mythology-inspired God, Jötunn. 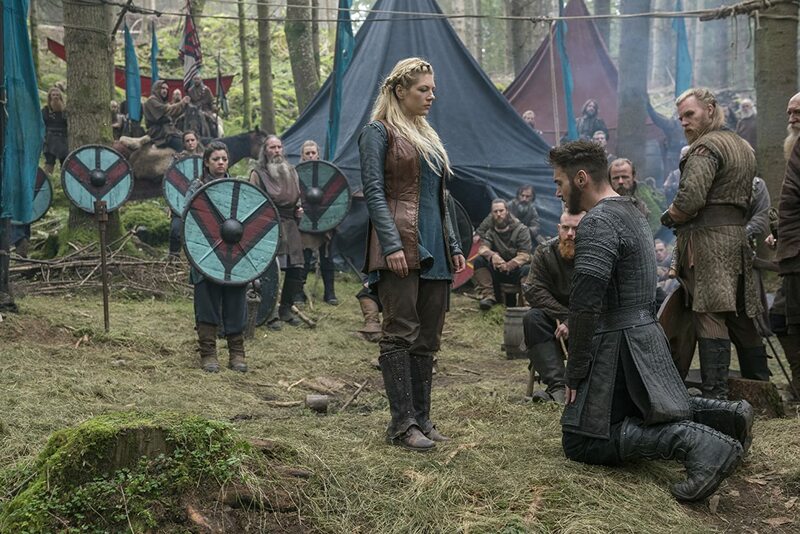 The runes also appeared in The History Channel show “The Vikings,” currently in it’s sixth season, painted onto the shields carried by warriors in various scenes. Dale of Norway thus accurately observed that Norse mythology is currently en vogue, as these examples, as well as the international success of the “Thor” superhero trilogy confirm. Indeed, if Norse mythology is currently experiencing revivified interest, then Netflix, Hollywood and other cultural producers are not the only people to take note of this trend. 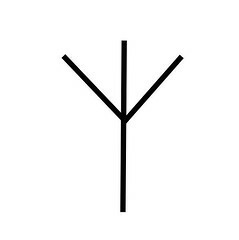 In the past few years, the Tyr rune has been reclaimed by Neo-nazi groups and featured on their recruitment fliers and banners in Neo-nazi marches and rallies. In response, the Anti-Defamation League and several other civil rights organizations classify the runes as hate symbols. The pattern of fascist groups drawing on Nordic religion is not new: The Tyr rune appeared in Nazi Germany’s Stormtroopers, and the Waffen SS Infantry Division because it represented so-called Aryan, Northern European warrior. Similarly, the Elhaz rune was used by Nazi germany in its Lebensborn program that encouraged Aryan SS soldiers to father children with “Aryan” mothers. The symbol has since been appropriated by Neo-nazi groups as emblematic of their assumed shared Northern European Caucasian heritage. It also appears in the logo of the National Alliance, once one of the largest neo-Nazi groups in the United States. The Olympic sweater controversy brings to light a problem that the Southern Poverty Law Center has noted, arguing that while researchers and politicians have examined in depth the “role of religion in radicalizing Muslims,” few have discussed how right-wing extremism uses religion to mobilize its violent adherents toward criminality and terrorism. Chip Berlet, a former senior analyst at Political Research Associates, argues that white supremacists may be attracted to Nordic mythological religions because of the interest of Nazi Germany’s leaders in Nordic myths and Nordic symbolism. “These myths were the basis of Wagner’s “Ring” opera cycle, and influenced Hitler, who merged them with his distorted understanding of Nietzsche’s philosophy of the centrality of will and the concept of the Ubermensch, which Hitler turned into the idea of an Aryan ‘Master Race,’” says Berlet. While some Olympians decided to not wear the uniform sweater because of its dark Neo-Nazi connections, Norwegians, neo-paganists and others have voiced their concern that by relinquishing those symbols, they were allowing neo-Nazis to hijack Norse mythology and Norwegian heritage.